The new year opens with the magnificent pairing of the solar system's largest planet with one of its smallest. 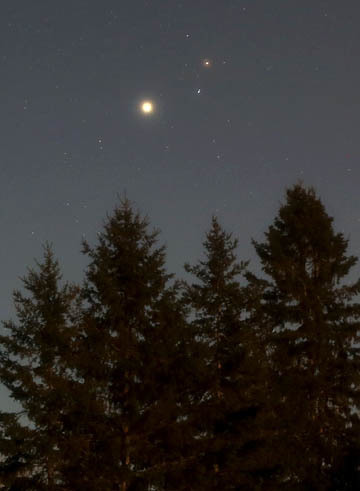 Jupiter, the star Alpha (α) Librae (Zubenelgenubi), and Mars (l-r)gather on New Year's Day at dawn. 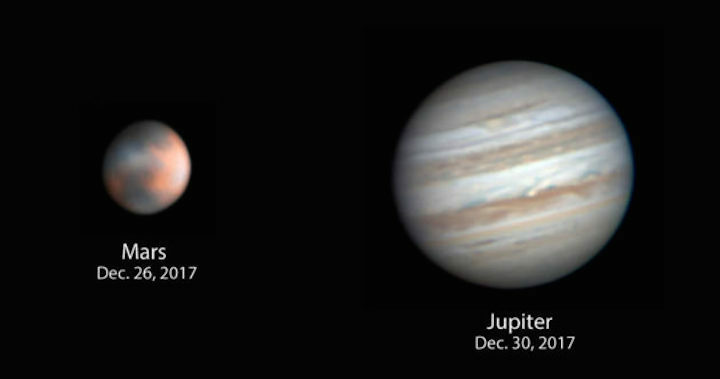 Mars and Jupiter will be very close on January 6–7. If there's one thing good about subzero weather, it's usually accompanied by clear nights. We've had plenty the past two weeks, so Moon and morning planet gazing have been fantastic. Dress for it and limit your time out to a half hour, and you'll thrive. Late sunrises make it relatively easy to get up for a look before breakfast. I'll wake up at 6:30, finish observing around 7:15, then have tea and breakfast. Astronomy, yes, that genteel pursuit. Here's hoping the cold continues, because 2018 opens with one of the year's best and closest conjunctions. Mars, hurrying east in the months before its opposition this summer, will practically crash into Jupiter (visually at least!) on the mornings of January 6–7. Watch for the Red Planet to slide only about 17 arcminutes — less than ⅓° — south of Jove on both dates. East Coast observers will see an 18′ minimum on January 6th, while Hawaiian skywatchers will see the pair a little tighter at 14′ that morning. 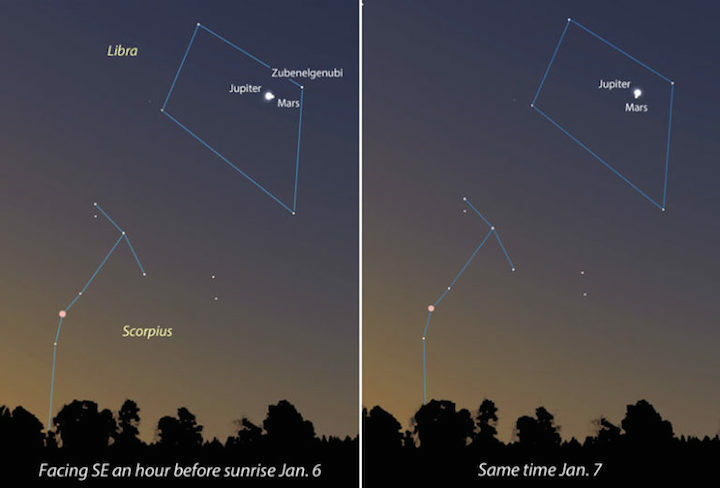 The next morning will feature nearly identical separations with Mars to the east of Jupiter. 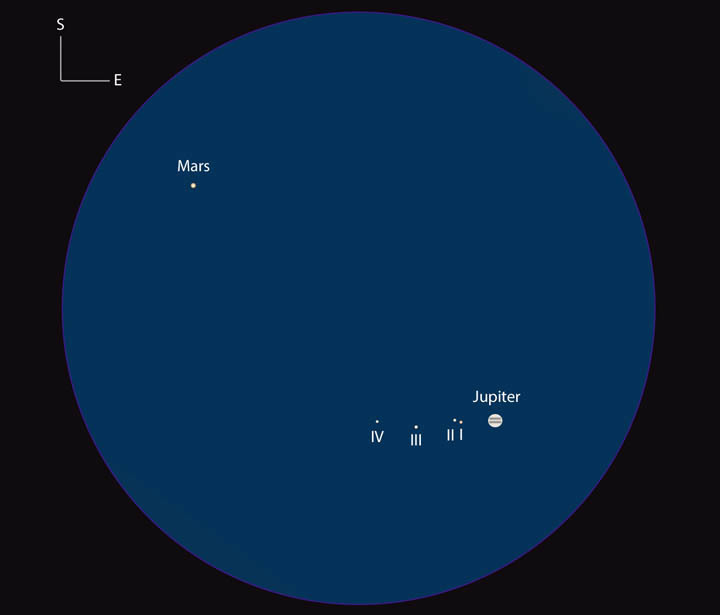 Shining at magnitude –1.8, Jupiter will clearly dominate this conjunction. Mars has been slowly brightening these past months but only manages magnitude 1.4. For the best view, I'd recommend watching the pair in early twilight at the first blush of blue in the southeastern sky, when they'll still stand out against the darker sky background. This is also a good time to photograph the event — the dawn blue plus moonlight will make for a richly colored backdrop. I like to use a 35- or 50-mm lens to include a scene. More sky around the two planets better matches the visual impression, too. With your camera on a tripod and the ISO set to 800, expose between 6 and 10 seconds. I'll also use a gentle diffusion filter to soften and "expand" the brighter stars and planets so they stand out apart from the fainter stuff. I hand-hold the filter in front of the lens for about a third of the exposure time or 10 seconds during a 30-second exposure. For two mornings, January 6th and 7th, Jupiter and Mars will be closest. Faster-moving Mars moves on, but the two will remain pleasingly close into next week. Conjunctions show off nature's phenomenal jewelry-making abilities. Even people who don't ordinarily watch the sky are dazzled by the sight of two bright planets close together. I like watching them approach each other and then part like bumper cars in slow motion. If you have a telescope, you can enjoy the conjunction on an entirely different level. Jupiter and Mars will shine in the same field of view at low and medium magnifications, giving us the chance to appreciate each planet's size and character. Mars is tiny at 5.7″ but large enough we can make out its gibbous shape and the more prominent dark markings in a telescope. Jupiter, now 33″ across, displays its classic north and south equatorial belts. Low magnifications of 50-70× will show the big planet's north and south equatorial belts, but you'll need at least 250× to detect any trace of Mars's dark albedo features. The drumstick-shaped Sinus Meridiani is currently in good view at dawn from North America; next week, fang-shaped Syrtis Major, one of the darkest, most easily identifiable features on Mars, will take center stage. The run-up to opposition is the best time to hone your planetary observing skills. Whatever feature is difficult to discern now will seem easy come July. That includes the north polar cap, also in view, but painfully small. This will be the view (south up) in a small telescope on the morning of January 6th around 6:30 a.m. (Central Time). Jupiter moons are Io (I), Europa (II), Ganymede (III) and Callisto (IV). On both Saturday and Sunday mornings, all four Jovian satellites will fan out on either side of Jupiter, and even the Great Red Spot (GRS) will make an appearance. It crosses the planet's central meridian at 14:52 UT (best for the western half of North America) on the 6th and 10:43 UT (best for the eastern third) on the 7th. Subtract 5 hours from these times for Eastern Standard, 6 for Central, 7 for Mountain, and 8 for Pacific. Good viewing of the GRS can be had for about an hour either side of meridian crossing. We can even use Jupiter's dominance to spot Mars through a telescope well into morning twilight or even after sunrise. I'm looking forward to a stellar coincidence. Not quite 3° to the west of the double-planet shines Alpha (α) Librae (Zubenelgenubi), Libra's brightest star and a wide double with magnitudes 2.7 and 5.1 separated by 4′. Located 77 light-years away, their true distance apart is nearly 140 times Pluto's distance from the Sun, or about 5,500 a.u. On the morning of the 7th, both the Jupiter–Mars combo and Zubenelgenubi's companions will have approximately the same position angle (northwest-southeast) and fit comfortably in the same binocular field. Call it a double-double, call it jewelry, but be sure to head out and see it for yourself. 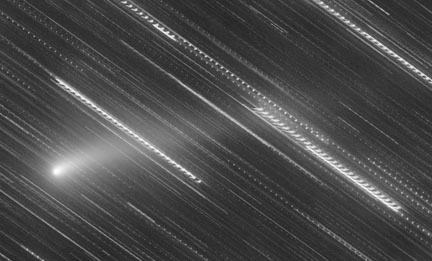 Comet Heinze (C/2017 T1) has developed a fine tail in recent days. This photo was made on December 30th. A heads up for comet watchers! With the Moon now out of the early evening sky, you'll want to look for Comet Heinze (C/2017 T1)the next few nights. The comet passes closest to Earth on January 4th as it speeds across Camelopardalis and Cassiopeia. It's currently magnitude 10 and sports a faint dust tail. Here's a detailed finder chart (stars to mag. 8) to help you track it.